Meet Whitney Wolanin, the newest recording superstar! Many teenagers can only dream of becoming recording artists, but for Florida native Whitney Wolanin, that is exactly what she is doing. At the age of thirteen, Whitney made her debut in Nashville, where her renditions of classics stunned some of the industries top musicians. Now at the age of fifteen, some of those prevailing tracks appear on her debut CD, Funkology XIII . With a great voice and a personality to match, I talk with Whitney and her Dad on her budding career, her passion for basketball, and much more! Families Online Magazine (FOM): When did you know you wanted to be a singer? Whitney Wolanin (WW): Well professionally I knew when I was about ten, but I have been singing all my life since I was very young. FOM: Your dad has a musical background- do you think it influenced you in anyway? WW: I think the thing that influenced me was that I was always around it so it got me interested in it. FOM: On your CD, along with original songs, you sing some classic covers - was that your decision? What artists do you admire most? WW: It was just kind of the process that we took on. I was just doing some great old songs, and now I hope I can make them for the modern time. I admire Alicia Keyes and Kelly Clarkson because they just have such quality to their voices and they stay true to themselves. FOM: You have said that you love all types of music; do you seen yourself going into other kinds of performing such as acting or Broadway? WW: I love acting. I've been doing acting for a long time too so it's probably something I would like to pursue. I have done school plays and stuff like that. FOM: When you performed at a girl's basketball game in Texas, you were so popular that an article was featured the magazine Women Basketball. I know you are a basketball player and fan, so how did you feel about that? WW: It was really cool because my song that I wrote was really about basketball and going for your dreams and focusing on them, so it was awesome to be able to get in touch with those who play basket ball and inspire them. FOM: During your national campaign in which you toured around the country in support of ill children, and each child received a copy of your CD. What was that like for you? WW: That was really fulfilling. I got to go to the hospital and visit these children and give them autographs. It was remarkable to hear their stories and hear about their progress. Every story was different and just as touching as the next. FOM: On your Christmas Album, Christmasology, you add some upbeat vibes to classic holiday songs, which is very unusual. In what stores will people be able to buy the CD? How do you think it will feel to hear your songs being played in stores? Vincent Wolanin(Whitney's Dad):It will be sold online in 200 different outlets like itunes. They will also sold in boxes of handcrafted Belgian chocolates. Actually, Whitney wrote the story on the back of the boxes. You can find the chocolates at high-end retail stores around the country and online at music.com. FOM: Each Christmas, your family puts on a concert benefiting children's hospitals, cancer research and scholarships for needy kids where you sing with a band compiled of members from famous rock groups such as ACDC and Survivor. Can you tell me a little about that? WW: I've sung for the past two years. It's really cool because I get to bring friends' because it's local. The fact it is for charity is cool as well. I have been performing with Jimi Jamison two years running. Jimi Jamison is my favorite performer and he gives me great advice so it was cool to perform with him. FOM: You are currently working on your second CD that is slated for a 2007 release, and you are writing your own tracks with some co writing of your sister, Victoria, who is a piano player. Where do you draw inspiration for your lyrics? Does Victoria have the same music tastes as you? WW: My sister and I have mostly same music tastes. We get our lyrics from our lives and things we are going through which other people probably are too. I also steal stories from friends but they know that! FOM: Aside from singing and performing, what are some of your favorite hobbies? WW: I love sports. I also love reading, which is one of my favorite things to do. I have lots of schoolwork. I am taking photography in school and I love to take photos of everything like scenic things and portraits all that stuff. FOM: Where do you see yourself in ten years? WW: I hope to be graduated from college and that I will have a successful music career going. I'd like to be in it [music business] for the long haul. FOM: Vincent, what is your role in Whitney's career? VW:I actually didn't want her to be in the business, but she really wanted to do it. She has it in her blood. I am a music producer and I write songs. I've been around this business for thirty-five years. I'm the person who helps Whitney avoid pitfalls in this business and am an adviser/father to her. It's a business where you have to be determined to succeed, and be prepared for the ups and downs, but I know Whitney's in it for the long haul. 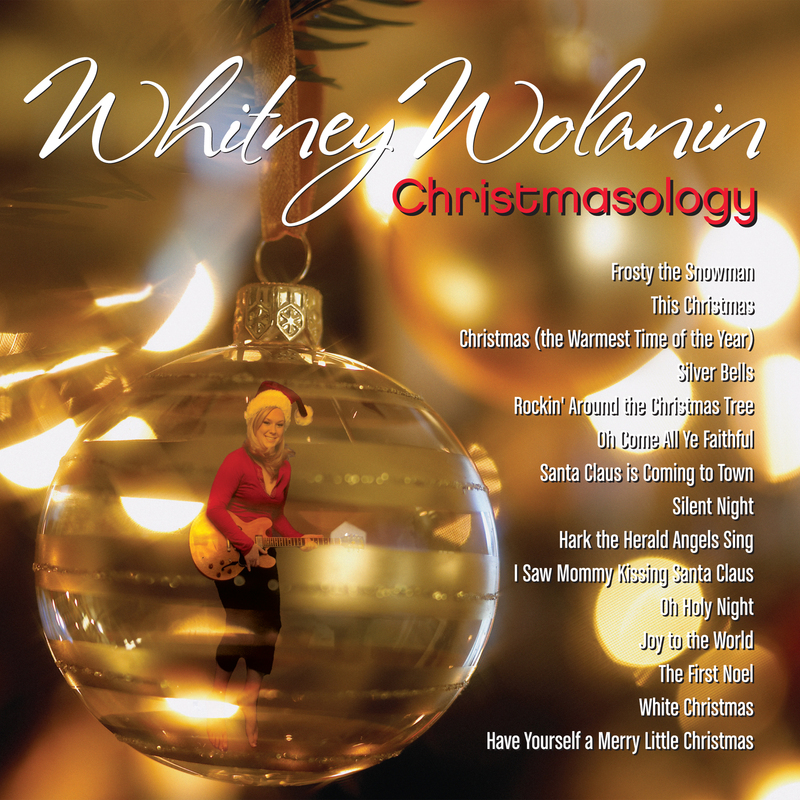 Whitney Wolanin Christmasology Album Front Cover of 15 Holiday Songs that gives New meaning to the True Spirit of Christmas.